Recent attacks in Yemen have caused severe damage to the country's infrastructure, slowing down the delivery of much needed aid. The International Committee of the Red Cross (ICRC) and Médecins Sans Frontières/Doctors Without Borders (MSF) are extremely concerned about the severe damage caused by recent Coalition attacks on airports in Sana’a and Hodeida, obstructing delivery of much needed humanitarian assistance and movement of humanitarian personnel. “Yemen depends almost completely on imports of food and medication especially for the treatment of chronic diseases”, says Cedric Schweizer who heads a team of 250 ICRC staff in Yemen. “Sana’a airport was an essential civilian infrastructure, and the main lifeline to supply essential humanitarian goods and services. "The harsh restrictions on importations imposed by the Coalition for the past six weeks, added to the extreme fuel shortages, have made the daily lives of Yemenis unbearable, and their suffering immense”, Mr Schweizer added. The disruption of the key logistic infrastructure, including airports, sea ports, bridges and roads are having alarming consequences on the civilian population, and the humanitarian situation has now become catastrophic. Checkpoints by the different armed factions have obstructed the delivery of urgent medical supplies to hospitals and have prevented patients and wounded to access essential healthcare. “The current conflict has already caused extreme hardship for the population across the country”, said Marie Elisabeth Ingres, who heads the MSF mission in Yemen. 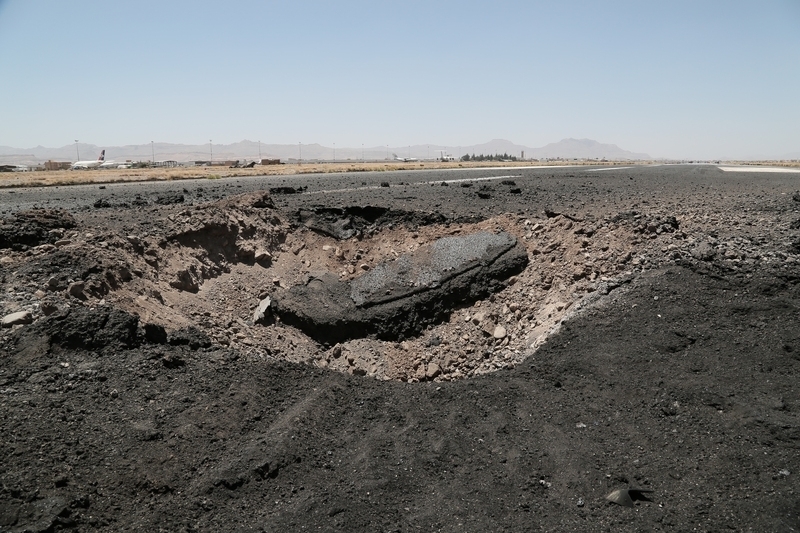 “The destruction of the Sana’a runway means that countless lives are now more at risk, and we can no longer afford to stand and watch as people are forced to drink unsafe water and children die of preventable causes”, Ms. Ingres added. MSF and ICRC demand that robust and unobstructed channels for the provision of humanitarian assistance are opened and respected by all parties to the conflict in this increasingly desperate situation.